Your guests will know that they have your whole hearted thanks when they receive these useful and cute heart jars filled with any special treat you choose. Part of Fashioncraft’s exclusive Personalized Expressions Collection, each three-fluid-ounce-capacity glass jar measures 3” tall x 2 ½” wide x 1 7/8” deep and has a heart shape with a sturdy flat base and a removable screw-on round silver metal cap for a tight seal. And to add a heartfelt personal touch, the top of each jar is perfectly fit for the application of the personalized label of your choice. Available in an exceptional selection of colors, themes and customized titles for weddings, showers or any special occasion, the labels are included in self sticking sheets for you to easily apply. 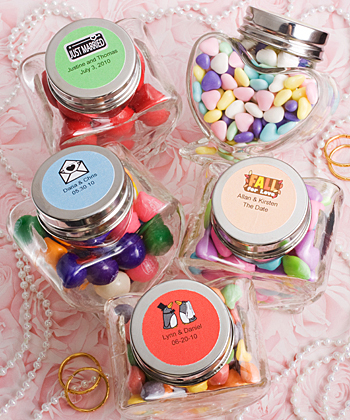 These glass jar favors come bulk packed. Please allow 3-4 days for production. Minimum order is 36 with free personalization.